I recently ordered a sensory training kit from Siebel Institute. 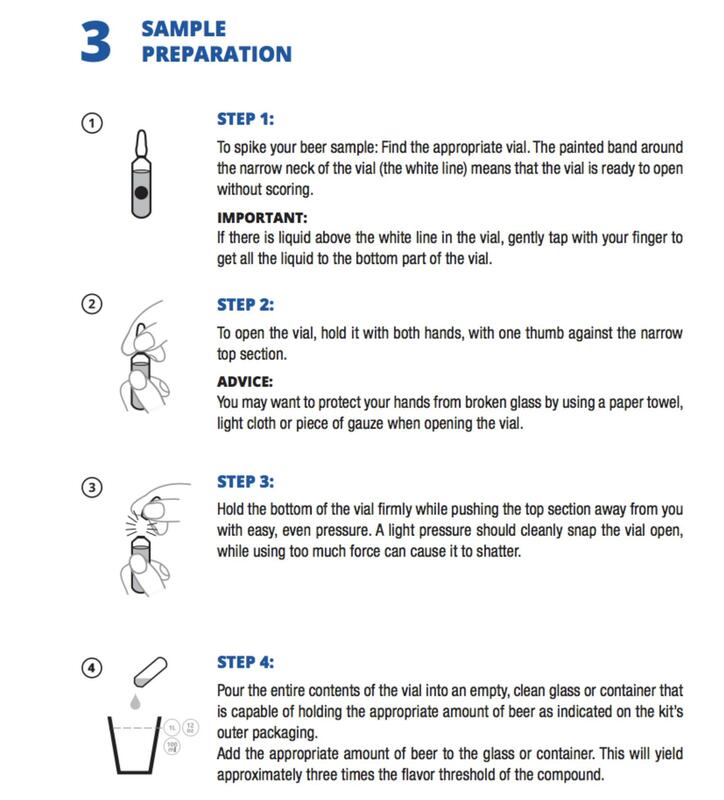 In short, glass vials of liquid isolating flavors (including off-flavors and contamination) commonly found in beer. I'll be hosting a party of six, and our tastes vary wildly: from craft drinkers to macro drinkers, and an enologist (winemaker). How should I select the base beer(s) to help us get the most out of this experience? Should we all have the same beer? If so, a macro, even though some dislike them? Or should I pick something like a pilsner? You want a mildly flavored, low hop beer for something like this. I would suggest a Kolsch or Helles Lager or a Mild. Pilsners can be heavily hopped. I have done a lot of this with wines when I taught winemaking classes at a community college near here. We used very low aroma wines like a warm climate sauvignon blanc. You want the same for this since you don't want anything to get in the way of your samples. Also keep a small cup of coffee beans and water nearby to "reset" your nose and mouth between smelling and tasting. I wouldn't do two different beers it will muddy things. Good luck! You should definitely all use the same beer as the base, and you want a beer that has a good balance of hops and malt. The less flavor the beer has, the more the "spiked" flavors and aromas will stand out. Too much aromatic hops (e.g., an IPA) will mask the aromas. Too much malt will mask the flavors. A lighter, neutral beer is the way to go for an educational tasting. I agree with everything farmersteve said except for the part about the coffee beans. That's an extremely strong flavor and aroma that will taint the beer tasting. As one who dislikes coffee, I can say that smelling coffee beans would ruin whatever beer sample I next tasted. I would choose Coors. It's easy to get, always tastes the same so it makes for a good control. Also, it is light in flavor so it won't mask anything. Not the answer you're looking for? Browse other questions tagged taste flavor lager craft-beers or ask your own question.